This dinner came out of one of THOSE nights. You know, the kind where you haven’t planned ahead. All of a sudden it’s 6:00 PM and you are scrounging in the fridge and pantry hoping to come up with something to feed the hungry mob that is your family. Luckily, I found the ingredients to put this together and it was a big hit with the Hubs and the boys. AND it was on the table pretty darn quick. 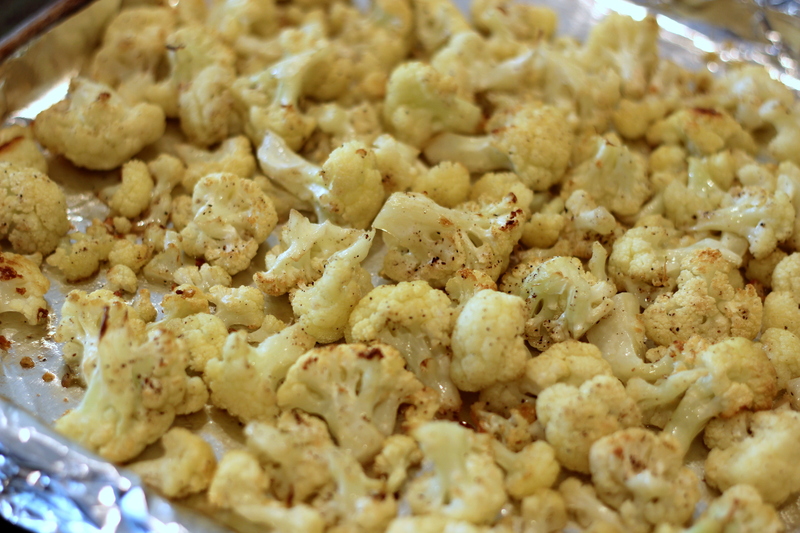 If you haven’t roasted cauliflower yet, you must try it. 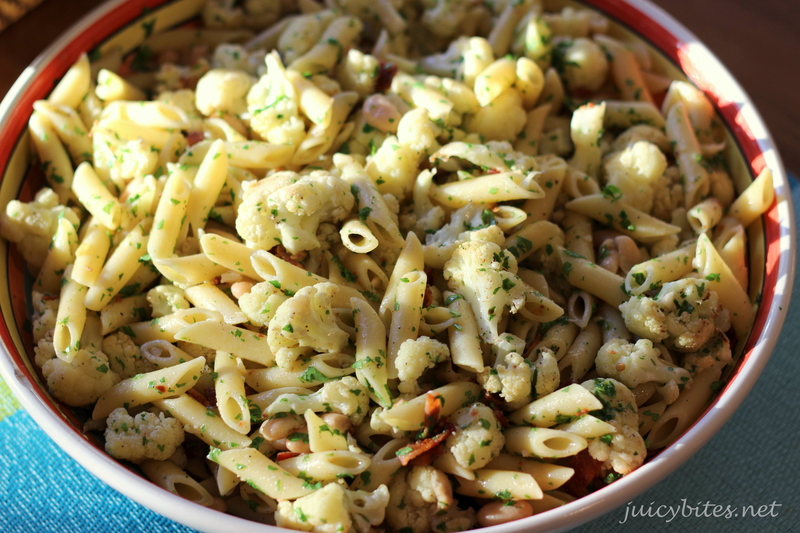 It might even turn an a cauliflower hater into a cauliflower lover (or at least liker). A while back I was at a friends house for dinner and she offered my son some cauliflower. He asked, “Is it roasted? I only like my cauliflower roasted”. My sweet little food snob…I was a little embarrassed but also a little proud. All you need for yummy roasted veggies is a cookie sheet, olive oil, salt and pepper, and a hot oven. I like to line my cookie sheet with foil so I can just toss it and have one less thing to wash. I always have several varieties of canned beans in the pantry. 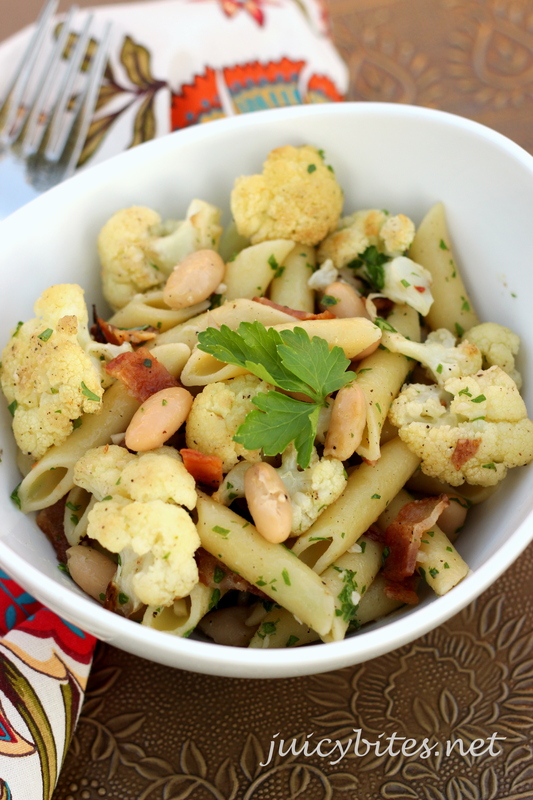 I add beans to pasta a lot for a dose of fiber and some protein. Plus they are delicious! The bacon adds a lot to this, and you don’t need to use that much for a big flavor boost. Pre heat oven to 425 degrees. Once your cauliflower florets are washed and dried, put them on a cookie sheet and drizzle them with olive oil (be generous – about 2-3 tablespoons). Toss them around to coat then sprinkle on some kosher salt and fresh ground pepper. Roast for about 15 minutes, giving them a stir once or twice, or until golden and tender. Line another cookie sheet with foil and cook your bacon slices at the same time as the cauliflower. Keep an eye on it, it should take about 10 – 15 minutes to cook. When the bacon is done to your liking, drain on paper towels and chop or crumble into small pieces. While your cauliflower and bacon cook, bring a large pot of salted water to boil for your pasta and cook until al dente (about 10 minutes). Drain the pasta and reserve about a cup of the cooking water. In a small pan, heat 3 tablespoons of olive oil over medium-low heat and saute your garlic for about 5 minutes while the pasta is cooking. Stir frequently so it doesn’t burn. Add your rinsed and drained beans, the red pepper flakes, season well with salt and pepper (it’s OK to over season this a bit, it’s going to flavor a whole pound of pasta), and cook for about 5 more minutes. Add a splash of pasta water (about 1/2 cup) to the pan before turning off the heat. This will make a little “sauce” to help moisten the pasta. 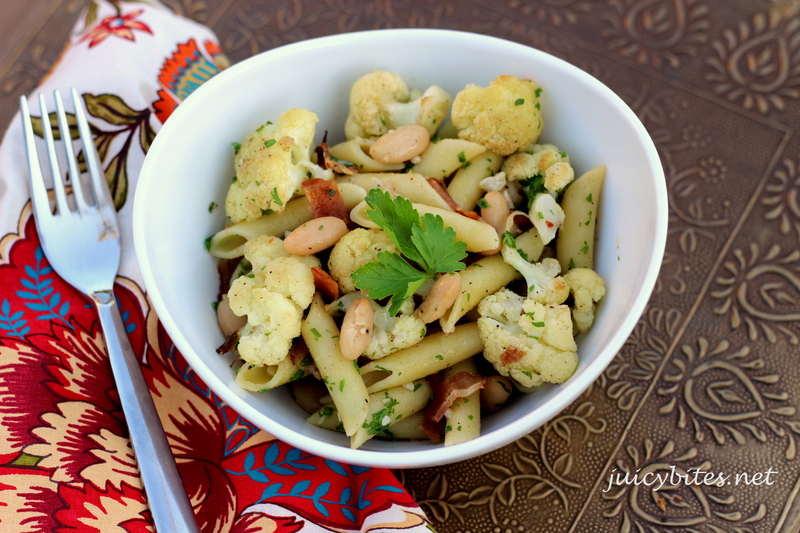 In a large serving bowl, combine your cooked pasta, the sauteed garlic and beans, the roasted cauliflower, the chopped parsley and bacon. Add a little more of the reserved pasta water if it seems dry and toss well to combine. Add more salt and pepper if necessary and drizzle the top with a little more olive oil (use the good stuff at this point, if you have it). Serve topped with fresh grated cheese.